When building retaining walls in the garden, or for more structural reasons, the addition of a membrane drainage layer can save a lot of trouble and money! Most retaining walls for gardens, for example, have to not only 'do the job' structurally but also need to look good too. A big problem can occur when moisture, or even standing water, is ever-present behind the wall and damp penetration comes through to the front. 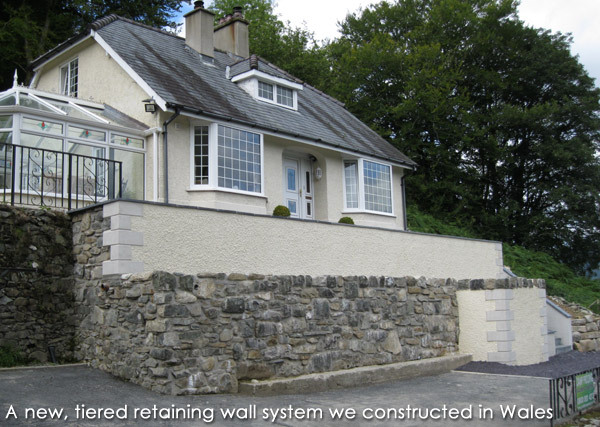 The water pressure on the back of the wall can add structural loading too, which can even cause failure in extremis; or may create the necessity for a larger structure to be designed. The obvious answer to this is land drainage; often in the form of long pipes with hundreds of tiny drainage holes in them which are available in many sizes from your local builders' merchants and are simply inserted into the ground behind the base of the wall as low as possible. Job done! Or is it? Firstly, the land drains must be installed properly at the base of the wall, or maybe even at multiple intervals on a tall structure, to allow drainage at different levels. Secondly, the pipes should be wrapped in a geotextile fleece, or the little holes will silt up and stop allowing water in which may severely restrict the effectiveness of the system. They should also be backed up with a suitable granular drainage material, which obviously will have to be bought and installed whilst creating another issue in that the original spoil will have to be taken away somewhere! Thirdly, a correctly installed system of land drains will indeed take the volume of water away and assist with a general land/water management program for your site but it will do little to prevent the pandemic dampness from working away at the back of your wall. This can be the most common cause of moss and lychen problems on retaining walls and of course water in the wall can also lead to frost damage at certain times of year; possibly even delamination where renders and tile claddings have been used as facings. So what is the answer to all these problems I hear you cry? 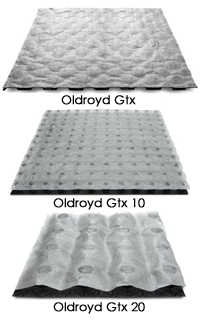 Well, an Oldroyd Gtx membrane could make a huge difference in addressing these issues. 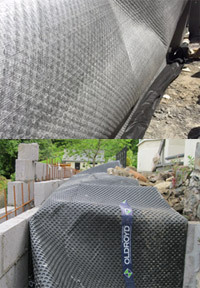 The membrane has a geotextile fleece bonded to it which allows water to pass and run down the cavity created, but does not allow soils and silts in. The result of this is that the cavity will always be free for the egress of ground water. The water will travel down the face of the membrane into the land drain pipe at the base as shown in the right hand image above (this picture shows the rear of the featured wall at the head of the page whilst it was under construction). As the membrane is available with 5mm, 10mm or 20mm cavity sizes, you can select the most appropriate one for your circumstances or expected ground water conditions. Secondly, it's cheap and will add very little to the overall cost of your project in the scheme of things. Thirdly, as it is protected by the membrane, very little ground water will get to the rear of the wall which will mean that, assuming that the wall has a suitable capping, the wall should for the most part only get wet from the front. This water may well penetrate a little but will have a very good chance of drying out the same way and is less likely to stay in the wall - this reduces the risk of moss, lychen and mould growth but also, and perhaps most importantly frost damage to your wall finishes; net result less maintenance and cleaning! Fourthly, and perhaps less obviously, once a gravel has been laid around the land drain at the bottom of the wall the rest of the excavation can often be back-filled with the spoil that came out. Your cavity drain channel will always be clear and doesn't need granular back-fill to make it work. When this is possible it can save a lot of expense on materials and spoil-removal! A drainage membrane of this sort, used in this way, will dramatically reduce the amount of moisture in your wall. However, you cannot use a DPC in retaining walls for structural reasons and most engineers would get very upset if you drilled hundreds of holes in the bottom of their walls for chemical injection; so unfortunately, addressing rising damp still needs a bit of work!